Body language | Mediascope, Inc.
Quick, pause for a second, and take a mental snapshot of yourself. What’s the expression on your face? Are you leaning forward, engaged in what you’re doing, or are you slumped in your chair? Better yet, put a rubber band around your wrist before you go to a meeting, and when you notice the rubber band, take another mental snapshot. Where are your arms? Are they defensively crossed in front of your body or are they relaxed on the table in front of you or along your sides? Are you sitting tall or slumped over the table? What’s the expression on your face? Did you know that body language accounts for over 90 percent of a conversation? Just as you use words in effective ways to achieve desired results, you can use body language to your advantage as well. Similarly, negative body language can be just as damaging as poorly chosen words and unrehearsed speech. 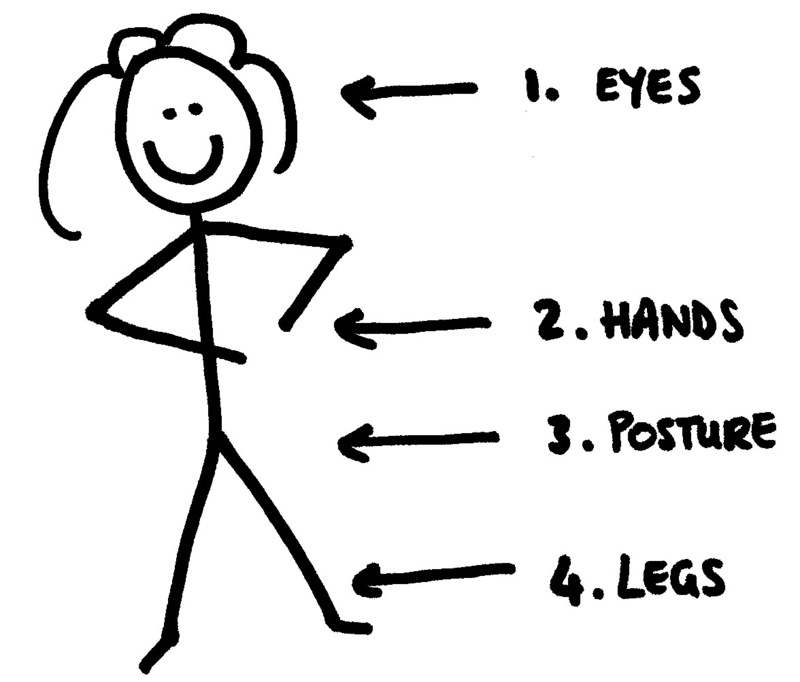 Here are a few suggestions for using body language to your advantage. Do: Make sure you have a firm handshake. Maintain constant eye contact and radiate a positive aura during the greeting. Do: Make eye contact and keep it. This displays confidence on your part and helps you understand what the other person is really saying. It shows you are paying attention. Professionals suggest maintaining eye contact for 80 to 90 percent of the time. Do: Stand (or sit) tall and with good posture. Your posture shows how you will approach a situation. If your arms are by your side rather than defensively crossed in front of you, it shows you are ready for anything. Do: Smile but don’t overuse a smile. Men smile when they are pleased; women smile to please. A genuine smile is more powerful. To gain and increase respect, first establish your presence in a room, then smile. It is more professional than to enter a room smiling for what appears to be no reason. Do: Pay attention to your legs and feet. Are they relaxed or are they jittering, tapping, or pointing towards the nearest exit? Are you sitting or standing in a way that means you are approachable or does it look like you would rather be somewhere else? Being aware of your body language is important not only for high-level meetings but in your day-to-day activities. Remember, what you’re not saying accounts for over 90 percent of the conversation.